The Ducks are in for fireworks when Hannah Galey brings her bat to Jane Sanders Stadium and beyond. 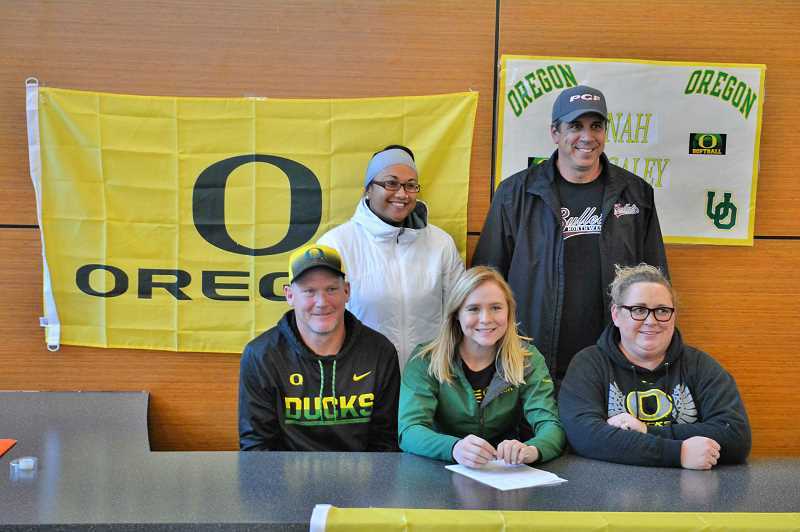 The Indians senior shortstop and Cowapa League Player of the Year, who hit a Scappoose High School-record 14 home runs this spring, announced her intent to attend and play softball for the University of Oregon Wednesday at Scappoose High School. 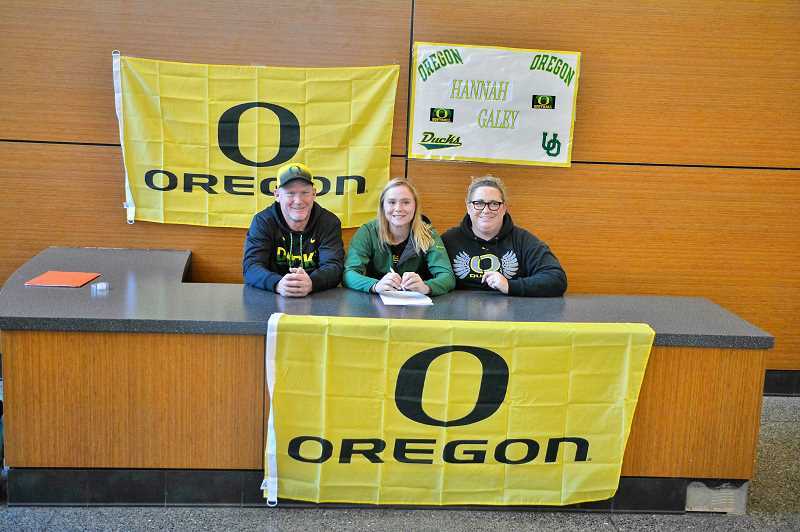 "Everyone's looking at you [at a signing ceremony], but it's nice to be recognized for hard work," said Galey, who batted .608 for 18 singles, 10 doubles, six triples, 60 runs batted in and 56 scores as the No. 5 Tribe (23-5 overall) reached the Class 4A quarterfinals against top-ranked eventual champion Henley (30-0) in its 25th state run in a row since winning the Class 3A crown in 1995. Galey, who grew up an Oregon fan where her father, Wayne, roots for Michigan and her mom, Tina, cheers for Wisconsin, started visiting softball camps in eighth grade and decided the Ducks were for her in the spring of her sophomore year, just around the time she hit a home run and caught Oregon coach Mike White's attention. "They're close to home and they're really good lately," said Galey, the last commit in her Class of 2018, who will be a utility player as she can play anywhere in the field. "I knew Oregon has one of the best sports business programs, and a lot of business kids go into sports management." 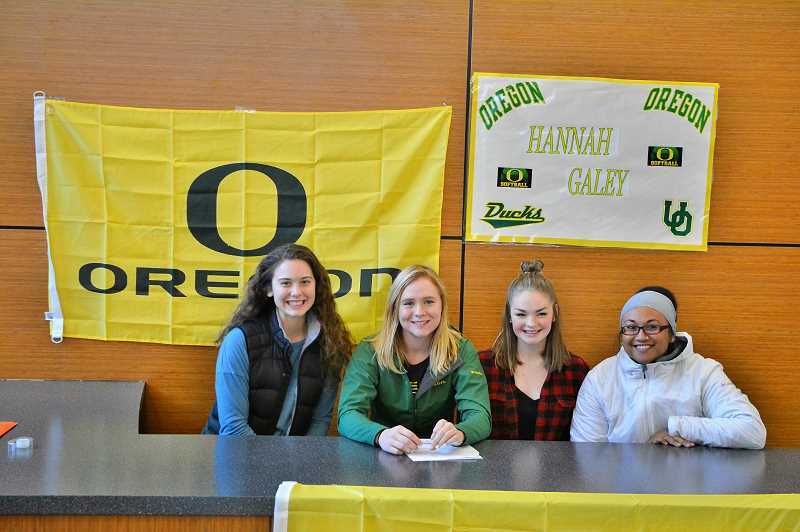 Ducks softball is famous for recruiting players as early as seventh grade and de-committing if they falter in high school, but Galey is better every year. "I am so so excited for Hannah and very proud of her for all the hard work she has put in to get to this point," Indians coach Cijay Koler said. Oregon went 54-8 this spring in search of its first NCAA championship after winning four of the last five Pac-12 Conference titles and, in a season in which many expected them to rebuild, reached the Women's College World Series semifinals against champion-to-be Oklahoma. "Knowing they're one of the best, there's a pressure to always do well," said Galey, who's in the midst of Writing 121 and AP Statistics, the latter of which requires passing a test for college credit, between now and when she begins her adventure in Eugene. "It's cool that it's a school everyone knows." In the meantime, Galey and Scappoose will swing for their first Class 4A crown in the new year before the Tribe ascends to Class 5A next fall.